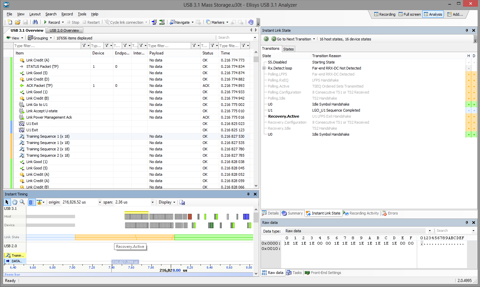 The following screenshot shows the Ellisys USB 3.1 analysis software with Mass Storage traffic and a SCSI Read transfer expanded. You can note the new "Link Credit 2" introduced in USB 3.1, as well as throughput of 1.02 GByte/s enabled by the enhanced SuperSpeed at 10 Gbps. This screenshot shows the Ellisys Instant Timing view, zoomed-in in order to distinguis clearly packets and link commands. This view is very useful for visualizing protocol sequences, as well as measuring timings with an unequalled precision. The Ellisys software can be configured in various modes for different tasks. 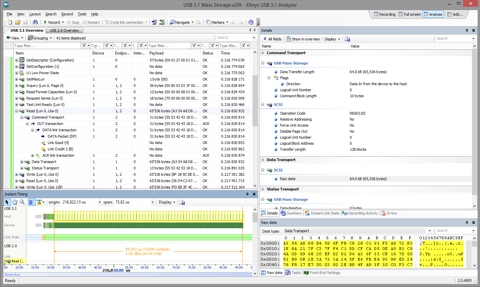 The following screenshot shows a perfect configuration for debugging LTSSM progression, with the Instant Link State showing the valid and invalid transition, and the overview and Instant Timing showing the LTSSM states changes precisely.